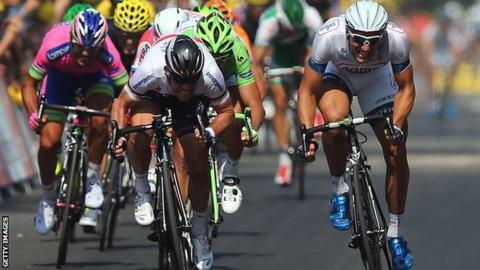 There were days at this year's Tour de France, in between Chris Froome's fireworks, when it seemed Mark Cavendish was the only rider in the race, which is some achievement when you are nearly four hours off the lead. If the Douglas dynamo was not winning stages, he was losing them, avoiding one pile-up, being blamed for another, throwing a tantrum about his bike, getting urine thrown at him or clashing with a journalist. There was even one day when a team-mate won a stage only to say Cavendish had told him how to do it. Cavendish's ability to generate stories is second only to his knack for winning, so it is hardly surprising he has just released a second autobiography, At Speed. The 28-year-old was in Salford earlier this month to surf the BBC's sofas and flog a few hardbacks. It is a mark of how far he has carried us all, in terms of cycling knowledge, that this time nobody asked him if he had a bell on his bike. We still have a bit to learn, though, as I discovered in the middle of a question about his amicable divorce from Team Sky last year. "One thing we've got to talk about is the Giro d'Italia," Cavendish interrupts. "I won five stages and the red jersey [the prize for the most consistent finisher] - a sprinter hasn't done that for ages. "There was a big thing made of the Giro when Brad Wiggins was going for it but when he dropped out everybody forgot about it. For a sprinter to win five stages and the red jersey is a big, big thing. "To then go and back it up at the Tour with two more stages, that's quite good." He is right. It is quite good. Winning that jersey made him only the fifth man to claim the points prize at all three Grand Tours [Italy, France and Spain], and the second of those five stage wins was enough to take him to the top of Cycling Weekly's all-time British rankings. The problem is, and Cavendish writes about this with admirable candour, "quite good" means relative decline. Four stage wins in 2008, six in 2009, five in 2010 and 2011, he even won three riding for a team that actively avoided the sharp elbows of the bunch sprint in 2012. Cavendish has made following the Tour easy for reporters: he has either won a sprint, or he has lost it. Not this year, though. This year somebody else won, a man Cavendish describes as a "Dolph Lundgren lookalike". Half a foot taller, two stone heavier and three years younger than Cavendish, Marcel Kittel had disappointed on his Tour debut in 2012, pulling out ill and winless in the first week. What a difference a year made. With Cavendish held up behind a crash, Kittel won the 100th Tour's first stage in Corsica. The Manxman would make it 1-1 four days later in Marseille, only for Kittel to win the 10th and 12th stages, the first after Cavendish controversially tangled with the German's Argos-Shimano teammate Tom Veelers, and the second in a flat dash to the line. Crashes, punctures and other bouts of bad luck (Cavendish turned up in Corsica on antibiotics for a case of bronchitis) happen, but defeats in one-on-one sprints? "Kittel is good," says Cavendish, stressing every letter. "He's not just had a good year, he's good." And then, just as it sounds like Cavendish is anointing his successor, the man L'Equipe hailed as the greatest sprinter in Tour history is back. "But at his age  I was winning five, so I'm not that worried," he says, as if anything else would be preposterous. "I know the problems we had this year, so I'm not stressed. "But it was the first time I felt really threatened, so I know I can't take things for granted anymore. I'm positive we'll dominate again." Words spoken in December will not count for much next summer, but he will only need to remember what happened in Paris, on cycling's most iconic drag strip, to find the motivation to keep fighting. "Three of us all finished within centimetres of each other, but the photo-finish spoke unequivocally: I had lost, yet again, to Kittel, had even lost out for second place to [old rival Andre] Greipel, and in the process lost my 100% Champs Elysees record and a little faith in myself," writes Cavendish in "At Speed". "Never before had I come across the line and glimpsed the Arc de Triomphe through the gloomy tint of defeat." Just to underline the point, there is a telling anecdote in sports writer David Walsh's latest book, "Inside Team Sky", the team Cavendish swapped for Belgian outfit Omega Pharma - Quick-Step (OPQS) last year. Sharing beers at Team Sky's victory party in Paris, mechanic Gary Blem tells Walsh about the time he said "well done" to Cavendish for coming second. Walsh writes: "'Gary," said Cavendish with the kind of post-race passion that is exclusively his, "don't ever, ever, congratulate me on finishing second'." It is hard to think of a better quote to sum up not only why Cavendish is tied for third in the Tour's all-time stage wins list on 25 (and with time to overhaul Eddy Merckx in first on 34), but he also might be the United Kingdom's most dependable sportsman. The most remarkable thing about his career is that he has done it all without giving much thought to how he prepares to race. That is not to say Cavendish has not worked hard; if anything he has raced too much. "He has always raced a lot," says his friend and training adviser Rob Hayles. "If you average it out across 2013, he raced every third day. "He knows he can't keep doing that, so this year we're going to load things towards the Tour: he will be racing less, training more. "We will also be doing a bit more gym work, a few new stretches, some cardio stuff… to be honest, I am amazed at how well he does by just riding his bike. He could get even better, but who am I tell him?" One possible consequence of this new approach is that Cavendish will not be on the start line to defend his "maglia rossa" at the Giro in Belfast. He had only intended to ride 10 to 14 days of it this year, but, having won four of the first 13 stages, Cavendish did not want to pass up a shot at a prize he had lost by one point in 2012. He got his jersey in the end, but it cost him. "Everybody who rode the Giro, let alone finished it, didn't do well at the Tour: its severity, the weather, the terrain, it killed us," he admits. "So if I do it this year, there's only a small chance of me finishing. I don't like not finishing races but I can't risk hurting my chances of getting the yellow (jersey)." Do not panic, Cavendish is not attempting to reinvent himself as Britain's next Tour champion. For the second straight year, the Tour is starting with a sprint. And if that is not alluring enough, it finishes in his mum Adele's hometown of Harrogate. "I want to win things in the build-up - and I want to do well at the whole Tour - but if there's one day I had to pick it would be that first stage in Yorkshire," he explains. Arriving at the start in Leeds a bit fresher will help, but the biggest cause for optimism about this new phase in his career is what happened a week after the Tour: his OPQS boss Patrick Lefevere realised Cavendish could not do it on his own. It is to the 2011 world champion's credit that he does not use his team's mistakes in the final kilometres of flat stages last year as an excuse, but it was clear to most observers that Kittel was being given a better sling-shot to the line by his lead-out men than Cavendish was getting from his. "You've got to give the other teams some praise," says Cavendish now, denying he was at times almost coaching his team-mates on how to slip-stream him to success. "[Kittel's team] Argos worked extremely well. So don't be derogatory towards us, give them the credit. "They were phenomenal. It was the best lead-out team I've seen since HTC, by quite a margin. "(Greipel's team) Lotto think they have it drilled - they don't, they just bash people out of the way. Argos have it drilled." The HTC he refers to is the team that catapulted him to 20 of his 25 Tour wins. It disbanded in 2011, the year Cavendish won the sprinter's green jersey at the Tour. His lead-out train at HTC was an awe-inspiring sight, with the final link being Australia's Mark Renshaw guiding Cavendish to within 200m of the finish. That double act was broken when the Australian tried his hand at being the main man elsewhere. Now, two years later, they are together again. If that doesn't have Argos and Lotto worried, Lefevere also tempted Italian veteran Alessandro Petacchi out of retirement to help the man he pipped to the green jersey in 2010 win it back from Slovakian superstar Peter Sagan. "We've strengthened our sprint team a lot, which is really promising," says Cavendish with the enthusiasm of a five-year-old on Christmas Eve. "We've signed Renshaw, who we know is the best lead-out man in the world, and I've already started working with Petacchi - he's just been mind-blowing, he is so smooth. "Combine those two with Gert Steegmans and Matteo Trentin, and we've got a formidable line-up. It's exciting." Exciting, yes, but something that must be practised, which means another change this season will be that whenever Cavendish races he will be joined by at least two of his Tour sprint train. "People said we didn't get our sprint train right this year," says the man who might instinctively know more about what it takes to win a sprint than anybody who has ever swung a leg over a bike. "But it normally takes two years to get a sprint train right; we were getting it right within six months. It took Sky two years to build a General Classification team, and that's not as intricate as a sprint team." The split-second judgements of riders travelling at 40mph might be intricate, but the mission statement is simple. Towards the end of his book At Speed Cavendish spells it out. "The Tour de France is my raison d'etre as a cyclist, the fulcrum of everything I do." Kittel and co, you have been warned. Cavendish has tried coming second and he didn't like it.